This one’s definitely a bit of a cheat after a busy weekend. 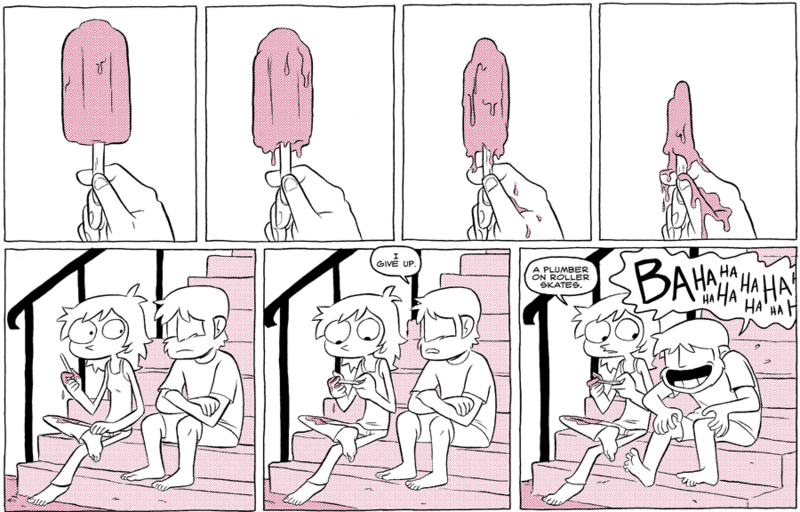 I probably could’ve made the text on the popsicle stick just a tiny bit visible, to clarify the joke. TV Tropes classifies this as an Orphaned Punchline. I like to imagine that there wasn't a joke printed on the stick, and Hanna said something that sounded like a punchline from a popsicle stick (yes, I noticed the alt text, but I can still pretend). Marek laughed at the incomplete joke because that's the kind of good-natured person he is. "What has wheels and a crack?" "What person needs both a half pipe and a full pipe?"